They thus approached death pious-minded. In the first year of Diocletian's general persecution of the Christians, Zachaeus, a deacon at Gadara beyond the Jordan, was apprehended. He was inhumanely scourged and then lacerated with iron combs. After this, he was remanded to prison, where his feet were stretched in the stocks to over four notches. This nearly rent his body asunder. Despite his sufferings, the steadfast martyr remained cheerful and praised God both night and day. He was soon joined by Alphaeus who was the son of a noble family of Eleutheropolis. He was a reader and exorcist in the Church of Caesarea. During these troublesome times, he encouraged the Christians to remain firm in the Faith. On account of this, he was apprehended and brought before the prefect. After having confounded the prefect in his first examination, Alphaeus was cast into prison. He was then summoned to appear in court a second time when his body was torn with whips and then with hooks. He was then committed to prison with Zachaeus and placed in stocks also. At the final examination, both Alphaeus and Zachaeus appeared together and confessed only one God and Christ Jesus as King. 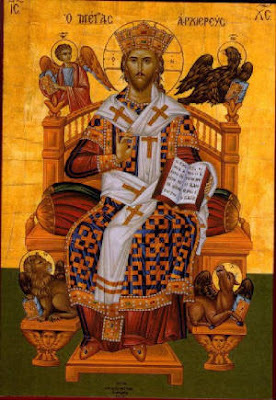 At this juncture, when they called Christ King, they were sentenced to be executed for treason, because they would not name the emperor as their only king, for their only desire was for God the Word. Therefore, they were beheaded in 303 A.D.
From The Lives of the Saints of the Holy Land and Sinai Desert, p. 527.